English astronomer who as a wealthy amateur built his own 24" diameter telescope, and with it discovered Triton, a moon of Neptune, and Ariel and Umbriel, satellites of Uranus. 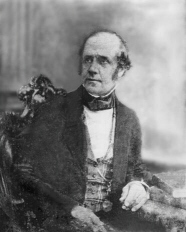 William Lassell was born 18 Jun 1799 in Bolton, Lancashire. He moved with his family in his mid-teens to Liverpool where he eventually made his fortune as a brewer. That career enabled him to pursue his life-long amateur interest in astronomy. In fact, his passion developed before he had much means to afford his hobby. Towards the end of his apprenticeship in a merchant's office, he began his astronomical observations in 1821. The 7½-inch Gregorian reflector telescope he used was of his own construction. By 1824, he had commenced in business as a brewer. From 1836, he urged the Borough of Liverpool to invest in building an observatory, which was opened in 1844 near the present Pier head. Meanwhile, he had moved his residence to the aptly named Starfield, in West Derby, near Liverpool, and added an observatory there in the summer of 1839. 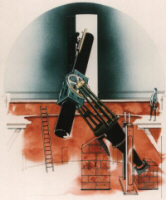 There he later constructed and mounted a 24" diameter speculum metal mirror in a reflecting telescope (1843-5). This was the first telescope with a large mirror to be to be mounted “equatorially” to allow easy tracking of the stars. It thus allowed an object in the sky, such as a star or planet, to be observed easily over long periods, move by a simple hand-cranking method. It paved the way for future development in reflector technology, leading to the large equatorial instruments seen in many national observatories around the world. The mirror weighed nearly 500 lbs. Lassell ground and polished it himself to produce a 20-foot (F10) focal length mirror of superb quality. With help from a fellow amateur astronomer, professional foundryman, and inventor of the steam hammer, James Nasmyth, Lassell made his own steam-driven equipment for grinding and polishing the mirror. This gave a parabolic curve accurate to better than a quarter of the wavelength of light, ideal for observing the planets. With this telescope he discovered several planetary satellites, including Triton, a moon of Neptune (10 Oct 1846). He found the eighth moon of Saturn, Hyperion, in 1848, one day after the American William Cranch Bond. But he was first to discover Ariel and Umbriel, satellites of Uranus (1851). In that year, when Queen Victoria made a visit to Liverpool, of the local notable people, it was Lassell that she especially asked to meet, and express her interest in his work. Lassell built a much larger, 48" telescope (1855) with 37-ft focus and used it in Malta. The choice to transport the telescope to Malta was to be able to use it there with the benefit of clearer skies (1861-5). In the years he spent there, he did some of his best work. He made fresh discoveries in the Trapezium of the Orion Nebula. He prepared a catalog of 600 new nebulæ, which was published in the Memoirs of the Royal Astronomical Society. Later he became president of the Royal Astronomical Society (1870-2). He died 4 Oct 1880, in Maidenhead. Having lived frugally, he left a fortune of £80,000, which would be equivalent to several million today. 18 Jun - short biography, births, deaths and events on date of Lassell's birth.